“It is sad to note that rural roads, which are statutorily referred to as local government roads which constitutes about 132,000 kilometres (67.7 per cent) of the entire road networks in Nigeria is the worst hit by this state of disrepair.”(Rural Access and Mobility Project, RAMP). Per capital income today is less than per capita income in the 1960’s, with the real wages of Nigerian workers now less than 35% of what it was in the 70’s. With a Gini-coefficient of 0.57, Nigeria has one of the most unequal distributions of income in the world. Nigeria has a 78% illiteracy level and despite having 70% of its 55 million workforce in the agricultural sector, Nigeria is a net importer of staple foods; domestic production of rice has never been able to meet the demand, leading to considerable imports which today stand at about 1,000,000 metric tonnes yearly. The imports are procured on the world market with Nigeria spending annually over US$300 million on rice imports alone. Nigeria is a maritime state with a coastline measuring approximately 853 kilometres; of the 36 states of the federation, nine are located on the coast where the waves of the Atlantic Ocean lap against the land and yet Nigeria imports between 700,000 and 900,000 metric tonnes of fish annually to partially meet a shortfall of 1,800,000 metric tonnes, thereby spending $800million annually on fish imports. The Obasanjo regime, in an extremely dubious deal of April 2006, celebrated the exit of Nigeria from debt entanglement, which was then estimated at 35 billion dollars. The celebration alone cost 2.4 billion Naira and he was beating his chest as a man who has done the impossible. Less than 5 years later, Nigerian debt has risen to 39 billion dollars, a figure that clearly surpasses the earlier figure. The significant difference between the present debt and the earlier one is in its composition. While the previous debt was predominantly foreign, the current debt structure leans more towards the domestic creditors; only 5 billion dollars is foreign held, while the remaining 34 billion is domestic. Though this is still less than 25% of GDP, it gives a pointer to what awaits the Nigerian economy in the coming period and this explains why there is so much panic among the Nigeria ruling class. Within this debt figure is 16 billion dollars allocated to power generation but pocketed by Obasanjo during his tenure; it includes almost 100 billion naira reportedly embezzled by Governor Daniel and Governor Akala, the 152 billion naira fraud involving Bankole. The EFCC investigations show that Bankole has spent some of these corruptly acquired funds to commence construction of high profile properties and to purchase the 32-storey NITEL building in Lagos. He is currently developing a N7 billion resort in the Akodo area of Lekki. Arisekola and other Nigeria billionaires had their names published in many public media in 2006 as debtors to most of the distressed Nigerian banks, and many of them still continue owing these banks and the response of the Government then was to provide public money to bail out these banks. It is also of interest to remind ourselves that many bank CEOs like Akingbola of Intercontinental bank and Ibru of Oceanic bank were spending depositors’ money on their various personal projects, which led to many of these banks collapsing after the first 2007 shock that rocked the stock exchange. The government bailed out these banks with over 5.3 trillion naira of public money and consequently it formed part of this domestic debt that the Nigerian ruling class is asking Nigeria’s masses to bear the burden of. Another significant portion of this debt is owed to contractors who are constructing and repairing roads. This has raised a lot of questions from Nigerians, which roads are being constructed and which ones are being repaired? Therefore, a booming Nigerian economy has only widened the gap between the extremely rich minority and overwhelming poor majority of Nigerian working masses. While this accelerates the accumulation of immense wealth in the hands of a handful, it pushes many more people into the abyss of poverty and want; it robs the poor to pay the rich. It calls on the already impoverished majority to tighten their belts and be prepared for hard times, while the ever diminishing fat cats continue to grow fat. It scares people with rising debt, while channeling the public wealth into private pockets. We are going through a boom, which deceptively presents billionaires Dangote, Akingbola and Ibru’s private debt as public debt, so as to swindle the people of their public property. Does this mean that the Nigerian ruling class is just playing games and its future is rosy? Obvously not! There is panic written all over their faces. They are everyday losing confidence in their capability to manage the incoming tsunami; they can see it coming but they unfortunately see themselves powerless to do anything to prevent it, because along the path of capitalism there is no solution to the catastrophe that is fast approaching. They can see Tunisia, Egypt and Greece showing them their future but what can they do to avoid this? Although, the Nigerian ruling class is one of the most inept and most inefficient ruling classes in the world, it has a very close and cordial relationship with its western masters; and its master in the western countries definitely must have informed them that with recession in Europe and significant slowdown in America, which will inevitably negatively affect the Chinese economy, it is just a matter of time before the price of oil plummets. The crashing of oil prices internationally is currently on the agenda and this clearly explains why the Nigeria ruling class is seriously panicking. It understands quite correctly that unlike in the 80’s and 90’s, there is no easy cash to be doled out by the IMF and World Bank if Nigeria is financially stranded. Western banks are still battling with their losses in Greece and Italy and are not in a very nice position to carelessly hand-out money to an economy with a bleak future. All this limits the available room for manoeuvring unlike in the past and this clearly explains why the economic policy of Goodluck, as dictated by the IMF through Okonjo Iweala, is taking on this aggressive form. The desperation to completely deregulate oil and gas, the aggressive sales of public property through privatization, cuts in education and public health, and the recent campaign for a Sovereign Wealth Fund, are policies aimed at saving the decaying capitalist system at the expense of the overwhelming majority of Nigerians. A sovereign wealth fund (SWF) is a state-owned investment fund composed of financial assets such as stocks, bonds, property, precious metals or other financial instruments. Sovereign wealth funds invest globally. Some of them have grabbed attention making bad investments in several Wall Street financial firms including Citigroup, Morgan Stanley, and Merrill Lynch. These firms needed a cash infusion due to losses resulting from mismanagement and the subprime mortgage crisis. Most SWFs are funded by foreign exchange assets. How does this fit into the Nigerian ruling class’s popular slogan of “Government has no business doing business”? If it is in the interest of the ordinary Nigerians, Government will have no business doing business; if it is in the interest of the rich and their Western backers, Government will have a very strong reason to do business. The global economic crisis has dictated this dramatically laughable change of policy of the IMF/World bank towards the “third world” countries. The IMF is no longer satisfied with massive sales of public properties at take away prices in the name of privatizations; it is no longer satisfied with huge cuts in public spending that further impoverishes the majority of Nigerians; the IMF has conveniently added to these policies the Sovereign Wealth Fund; that is, it is asking Nigeria to ensure huge savings from the proceeds from oil and other social cuts, savings not for the purpose of investing in Nigeria because “Government has no business doing business”, not for the purpose of improving the life of the overwhelming majority of Nigerians because “Capitalism is a system for the minority against the interest of the majority (1% against the 99%)”, but savings for the purpose of investing in the western market. How laughable does this sound? The poorer countries should not invest in their own countries where there is urgent and desperate need to do so, but should turn around and invest in the rich western countries because they are going through a financial crisis; that is, the rich will be fed from the belly of the poor! Obviously, the Nigerian ruling class is one of the most subservient to the dictates of the western powers, in the world. 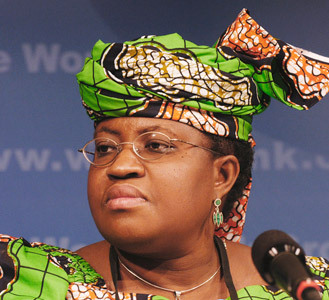 The IMF has a direct representation within the government in the person of Okonjo Iweala who will go to any extent to get the imperialists’ interests protected to the last. Along the path they have mapped out, the consequences are glaring! It will inevitably lead to an open clash between the overwhelming majority of Nigerians and the ever diminishing minority of exploiters. Egypt and Greece have provided an example of what is to come. With their policies, revolution is on the agenda and there is no other possible alternative policy on the basis of capitalism. Only a social and economic system that focuses first on the interests of the majority and not on the profits of the few, can harness all the Nigerian resources, both human and material, and unleash the full capacity of Nigerians for the purpose of actualizing the full potential of the country. That system is Socialism and it is the only alternative to blood sucking capitalism. It is absolutely impossible to find a solution within a system that puts profit first before human needs, which judges the rationality of everything based on profitability, a greedy system that promotes greediness and turns man to beast. Therefore the real enemy is neither corruption nor the mediocrity of the Nigerian ruling elites as such, but the dying system that breeds corruption in which the Nigerian ruling elite are mere appendages of the western powers. That is what the capitalist system is, especially in very backward countries like Nigeria. The alternative system is the only way out and this alternative is inconceivable without first booting out these degenerate servants of the imperialists.